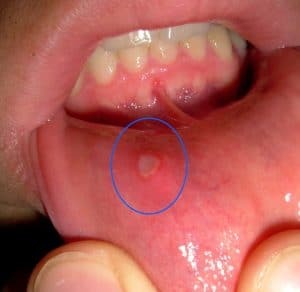 What Are the Causes of Canker Sores? How Can You Prevent Canker Sores? Canker sores can appear in different forms inside the mouth. Aphthous stomatitis refers to a specific type of mouth ulcer that causes great pain. This ailment can affect people of different ages, from small children to adults. The most affected areas include the lips, the tongue, and the inner part of the cheek. In some cases, this can also extend to the upper regions of the throat. Herpetic stomatitis (or herpes labialis) is a disease of the oral cavity that occurs when the lining of the mouth becomes infected and vesicles develop. This is the consequence of the herpes virus, which is the same as the chickenpox. These vesicles can break and cause severe local pain. Specific causes for this ailment remain unclear, although researchers are convinced that a wide array of factors lead to the outbreaks. How Do You Prevent Canker Sores? According to the Journal of the American Dental Association (ADA), individuals can prevent the development of canker sores by maintaining good oral hygiene. In addition, it is important to floss the teeth once a day and preferably use a toothbrush with soft bristles. Using an antibacterial mouthwash has also been shown to reduce the risk of developing canker sores. To prevent mouth damage, avoid mouth irritating foods, including salt water and reduce stress. Foods that can trigger mouth ulcers include coffee, spices, nuts, pineapple, and tomatoes. Avoid talking while eating and chewing because this can cause buccal lesions that weaken the mucous membranes and favor canker sores. When brushing your teeth, exercise caution to avoid hurting the gums. If you wear dentures, ensure that they fit snugly otherwise consult your dentist. There are several over-the-counter numbing and protective oral agents that can be used to lessen your discomfort while the sore heals. You could also apply a thin layer of paste made of baking soda and water to the lesion and hydrogen peroxide is a good disinfectant. Coconut oil provides a viable way to reduce swelling and promote healing thanks to its anti-inflammatory, antibacterial, and antiviral properties. What Causes Teeth Grinding?Am I Grinding My Teeth at Night? What Types of Whitening Treatments Are Available?